Students and staff at BackTrack check out their new power drills with Northern Tablelands MP Adam Marshall and Essential Energy Community Relations Manager David Crough. From left, Adam Marshall, Phillip Pickford, Matt Pilkington, Nathan Bliss, Mike Moran, Trey Fernando, Brendan Nean and David Crough. 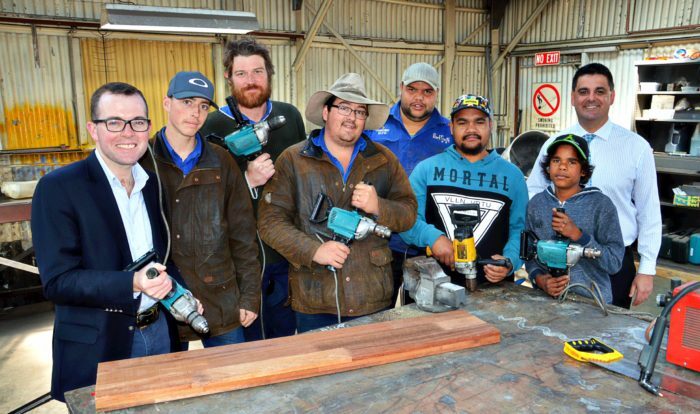 THANKS to the generosity of Essential Energy and the quick thinking of local MP Adam Marshall, Armidale’s BackTrack students can now get to work on a new fencing contract using 13 preloved, well-maintained industrial drills. Mr Marshall said Essential Energy Northern Community Relations Manager David Crough had approached him recently to ask if there were any community organisations that would appreciate being gifted equipment the company was no longer requiring. “I had no hesitation in suggesting BackTrack,” Mr Marshall said. “The community is very familiar with the amazing work the students do out there and I felt quite confident that staff would be more than delighted to take up Essential Energy’s generous offer. Mr Crough said Essential Energy was very pleased BackTrack had found a use for the industrial drills that were now surplus to their requirements and delighted to have been able to provide this support for the students. “The BackTrack AgLads Program is a great fit for the donation as it will benefit the communities we serve across rural and regional NSW given their objective is to address trade and agricultural skills shortages,” Mr Crough said. BackTrack Founder Bernie Shakeshaft thanked Essential Energy and Mr Marshall for their support and said the donation was timely given the extra work about to be taken on by the organisation. “The boys really appreciate the generous donation and are really excited about putting them to use in the coming weeks when we start our new fencing contract work,” Mr Shakeshaft said.